While incandescent bulbs use a lament and CFL’s use gas, LED’s produce light by exciting electrons. Put simply, within every LED bulb there is a semiconductor material filled with positively and negatively charged particles. When electricity strikes the semiconductor (the light is turned on), the electrons become charged and ow from the negative to the positive layer within the semiconductor. As they move, the excited electrons pass through “holes” in the material, which causes them to emit photons of light and illuminate the LED. LED is currently the most efficient way of illumination and lighting, with estimated energy efficiency in the range of 80%-90% when compared to traditional lighting and conventional light bulbs. This means that about 80% of the electrical energy is converted to light, while a ca. 20% is lost and converted into other forms of energy such as heat. LEDs are “directional” light sources which means they emit light in a specific direction, unlike incandescent and compact florescent bulbs which emit light and heat in all directions. For this reason, LED lighting is able to use light and energy more efficiently in many applications. LEDs use less energy to produce a similar lumen output to those of traditional lamps due to their greater efficiency. Less energy means immediate savings on energy usage costs. Furthermore, the longer lamp life of LEDs reduce the maintenance costs required to change out lamps that have stopped working. LEDs are extremely durable and built with sturdy components that are highly rugged and can withstand even the roughest conditions. 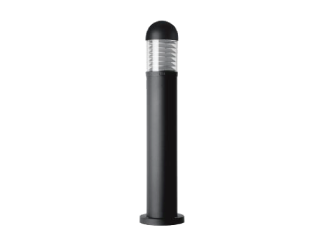 Since LED lights are resistant to shock, vibrations and external impacts, they make great outdoor lighting systems for rough conditions and exposure to weather, wind, rain or even external vandalism, traffic related public exposure and construction or manufacturing sites. 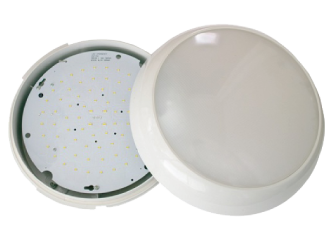 LED illumination produces little infrared light and close to no UV emissions. Therefore LED lighting is highly suitable not only for goods and materials that are sensitive to heat due to the benefit of little radiated heat emission, but also for illumination of UV sensitive objects or materials such as in museums, art galleries, archaeological sites etc. Furthermore, LEDs do not incur flickering effects. It’s a digital lighting technology that is tuned for 100% performance. This is the reason why there is no flickering, as experienced with some florescent lamps and makes them ideal for an office environment. ff switching does drastically reduce operational life expectancy. This makes LED preferable for developments with high switching frequencies in locations operated by motion detection. In instances where motion detection is saving energy with traditional lamps, it is in fact also reducing the life of the lamp.  At an average ESB rate of €0.16 per unit (kWh), plus 13.5% VAT, costs €14.00 annually for energy. A 28W 2D Fluorescent Lamp, allowing for 10% gear losses, uses 269.81 kWh per year. 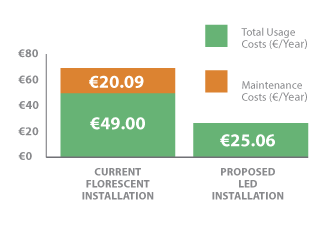 At an average ESB rate of €0.16 per unit (kWh), plus 13.5% VAT, costs €49.00 annually for energy.  A replacement 15W LED tray, with 5% gear losses, uses 137.97 kWh, €25.06 annually. A 2 x 58W T8 Fluorescent Fitting, allowing for 10% gear losses, uses 1,117.78 kWh per year.  At an average ESB rate of €0.16 per unit (kWh), plus 13.5% VAT, costs €202.99 annually for energy. 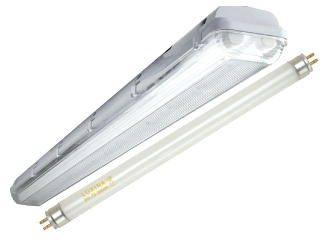 A replacement 24W LED tube, with 5% gear losses, uses 220.75 kWh, €40.09 annually. 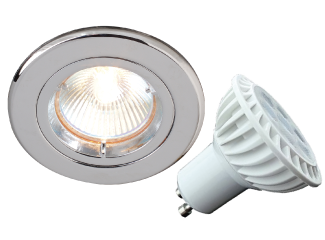 A 50W GU10 Downlight, allowing for 15% gear losses, uses 503.70 kWh per year. 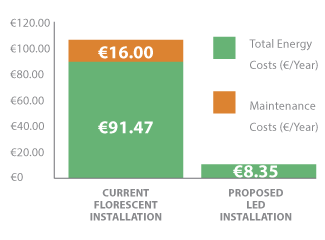 At an average ESB rate of €0.16 per unit (kWh), plus 13.5% VAT, costs €91.47 annually for energy. A 70W SON, allowing for 15% gear losses, uses 336.49 kWh per year. 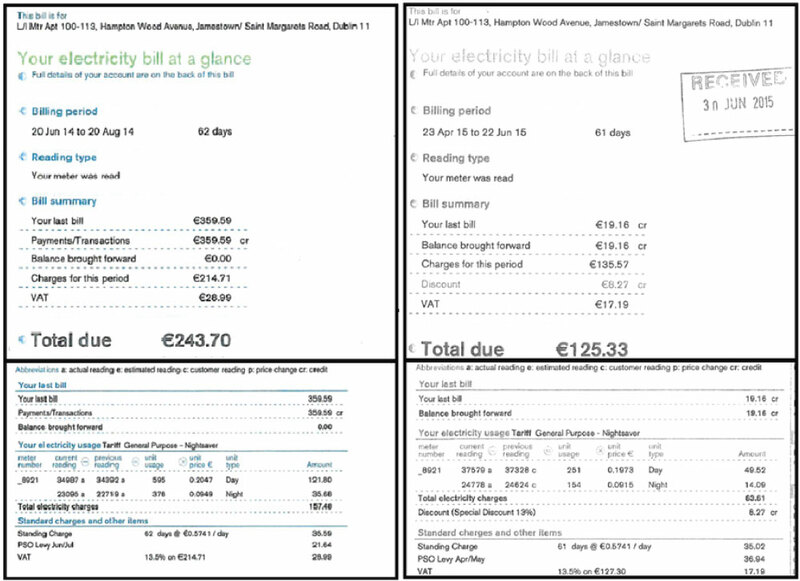 At an average ESB rate of €0.16 per unit (kWh), plus 13.5% VAT, costs €61.11 annually for energy. A replacement 9.5W LED tube, with 5% gear losses, uses 41.70 kWh, €8.35 annually. The sensor is an active motion sensor. It emits a high-frequency electro-magnetic wave (5.8GHz) and receives their echo. The sensor then detects changes in the echo from the slightest movement and switches on the fitting. As this sensor does not require line of sight to detect, it is the ideal solution for stairwells, corridors, car parks, utility areas or store rooms. The sensor will also be fitted underneath the fittings cover, hence will have no visual impact to the environment. All savings will be dependent on the actual occupancy or footfall through a given area where the microwave will be operational. However, savings of up to 80% is possible in certain environments. ed lamp life of 8,000-10,000 hours. With 8,760 hours annually, that’s a lamp change once a year on average. Average lamp life of LED is 30,000 to 50,000 hours (5 years). Hampton Wood is a residential development in the Finglas area, consisting of 196 apartments spread over 12 blocks with an underground carpark. There were 89 no. – 8W Emergency Exits, required to be on (fully maintained) at all material times. tted to an LED 18w Tray with a microwave sensor for occupancy detection. 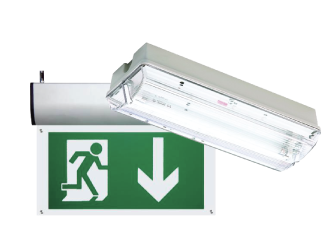 8W Emergency Exit Boxes were replaced with a 4W LED Emergency Exit Box. 2x58W 5ft ttings were re-wired to accommodate an LED tube and a microwave sensor was installed for occupancy detection. For 2x58W 5ft Emergency fittings, a non-maintained 3W bulkhead was installed to satisfy Emergency Lighting requirements. tted to install 9.5W LED lamps. Microwave Detectors – Occupancy and Daylight detectors in one device. The sensor is an active motion sensor. ttings would be repaired or replaced on each quarterly maintenance visit. Lara proposed a 3 year payback period, with monthly payments equal to those of the estimated monthly savings that were to be achieved when compared to a fully operational lighting system. In essence it was a cost neutral project for the development. This allowed the development to make dramatic savings and not have to outlay any payments as all monies due were to be paid from the savings made. In return the development also achieved a fully functioning and fit for purpose lighting system. The installation cost and payback period was further reduced by Lara seeking an Energy Grant from an Energy provider seeking energy credits for carbon emissions created through electricity generation. The Hampton Wood retrofit received a grant for €9,376.74 plus VAT @ 23%. This credit was passed on in its entirety to the development and reduced the cost of installation. Construction of the development was concluded in early 2008. It is assumed that all lights were fully operational during this ESB reading period. Thus the average daily energy usage for a fully operating lighting system is 603.04 kWh per day for the entire development. Point 1-2 – The oscillation of the energy curve coincides with the variance in daylight hours throughout the year. The initial reading in Feb-08 is for the winter 07 period up to February, were the lights on photocell are operating for the peak amount of time, to Point 1 in Jun-08 the summer months with the least amount of energy usage. The curve then begins to peak again to Point 2 the winter months of 2008. Point 3 – The energy curve begins to peak for the winter months in 2009 similar to above. However the energy usage is less to the previous year due to lamp and fitting failures. the light, shortens the life of the lamp. Note that all energy usage is not Actual Readings, whereby some readings are ESB Estimations. Therefore whilst not always exact readings for the data above, the curve is a close approximation. Note that the readings at the start and end of the graph are “Actual Reading”, whereby thereadings were read off the meters.